incision of the tympanic membrane, usually performed to relieve pressure and allow drainage of serous or purulent fluid from the middle ear. Sometimes, as in the case of serous otitis media, a ventilating tube called a grommet is inserted to permit continuous ventilation and avoid a chronic middle ear problem with fluid accumulation, pain, and loss of hearing. When a simple myringotomy is done for purposes of draining purulent material resulting from recurrent suppurative otitis media, care should be taken to avoid contamination by the fluid. Eardrops may be prescribed if there is fluid in the ear. The ear should be kept dry for two weeks after the procedure, with no fluid entering the ear until the myringotomy site in the eardrum is healed. Myringotomy and insertion of a tympanoplasty tube as treatment for otitis media. From Frazier et al., 2000. Puncture of the tympanic membrane with a needle to aspirate middle ear fluid. /tym·pa·no·cen·te·sis/ (tim″pah-no-sen-te´sis) surgical puncture of the tympanic membrane or tympanum. 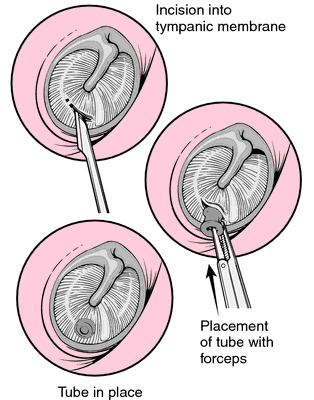 surgical puncture of the tympanic membrane or tympanum. Diagnostic accuracy of otitis media and tympanocentesis skills assessment among pediatricians. Presently, the most common bacteria present on tympanocentesis is called non-typable Haemophilus influenzae, at least half of which produce an enzyme called beta-lactamase that makes them resistant to amoxicillin. These children underwent tympanocentesis to identify bacterial isolates during the 9-year period from 1995 to 2003. A small number of children were referred to consultation with otorhinolaryngologist and none had undergone tympanocentesis, which is probably related to the small number of children with recurrent AOM or complications, such that the majority of AOM episodes is likely handled in pediatric offices and treated with oral antibiotics. From the tympanocentesis procedures, a pathogen was identified in 162 cases: nontypable Haemophilus influenzae (n = 94); S.
Bacterial eradication can be proven only by double tympanocentesis. If resistant S pneumoniae was the isolate identified with tympanocentesis, clindamycin became another choice (TABLE 2). One possibility is an important difference in our study design, compared with that of the NEJM study All the children in our prospective study have a tympanocentesis to confirm the clinical diagnosis, and our research has shown that tympanocentesis results in immediate relief of ear pain and reduces the frequency of antibiotic treatment failure about twofold, compared with children diagnosed and treated by the same physicians in the same clinic practice. Five-day treatment of ear infections? The Study: The American Academy of Pediatrics (AAP) has issued a protocol for treating ear infections, which includes tympanocentesis (making a hole in the ear drum, obtaining fluid from the middle ear and culturing it), and instituting treatment based on the results of the culture. About 50% of patients have evidence of otitis media, with bacteria growing out in studies on tympanocentesis. In acute otitis media, tympanocentesis performed before and after drug therapy has been used in several studies to determine the clinical relevance of antimicrobial resistance. Additionally, tympanocentesis was performed before the study drug was administered and pathogens from middle-ear fluid samples were isolated and identified.